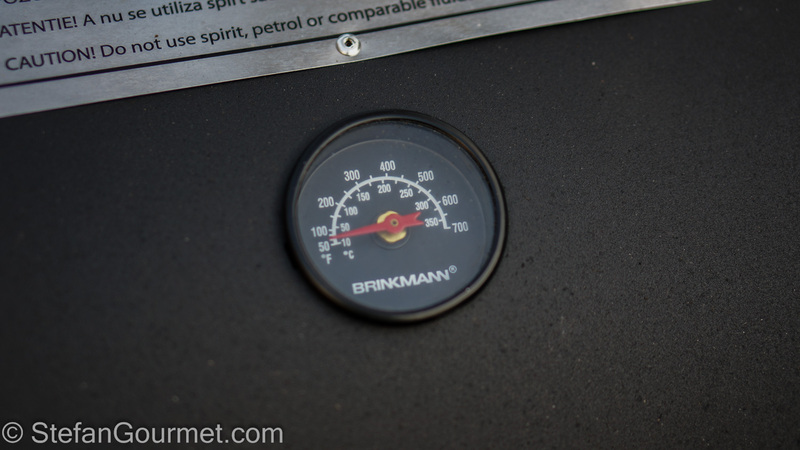 I’ve had a tabletop smoker for hot smoking for years and I use it often, for instance to make hot-smoked salmon or hot-smoked scallops, or to smoke a brisket or a ham hock before cooking it sous-vide. Such a smoker does two things at the same time: cooking (it is basically a small oven that gets pretty hot inside) and smoking. It takes 15-20 minutes to cook to food, so that is also how long you can smoke it without overcooking it. 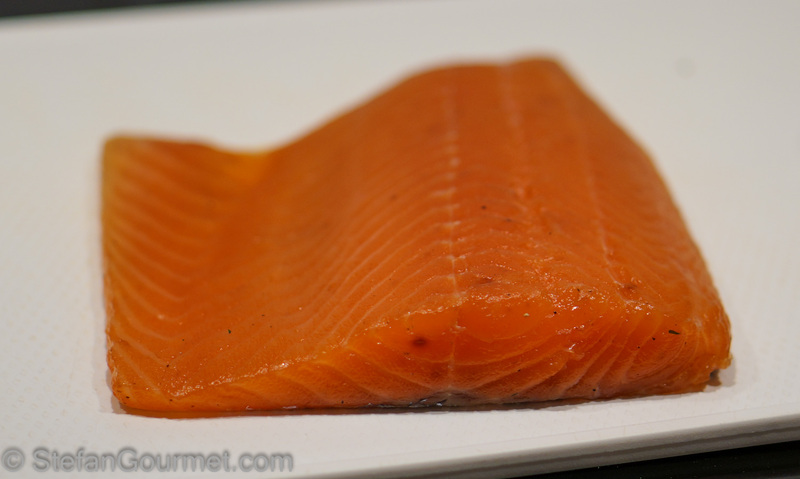 You can’t make ‘smoked salmon’ (i.e. salmon that is only cured and smoked, but not cooked) with it, as you can only generate smoke by heating up the entire smoker. Now I have a new contraption, which is a “cold smoke generator”. It is basically a ‘maze’ that is filled with smoking dust and then lighted on one end. The smoking dust will burn very slowly in about 10 hours, generating smoke but hardly any heat. 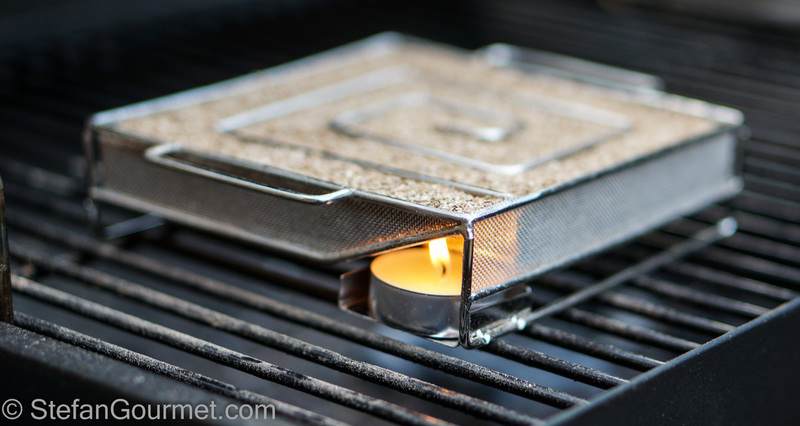 You can put this smoke generator in any closed but ventilated space, such as an outdoor grill. 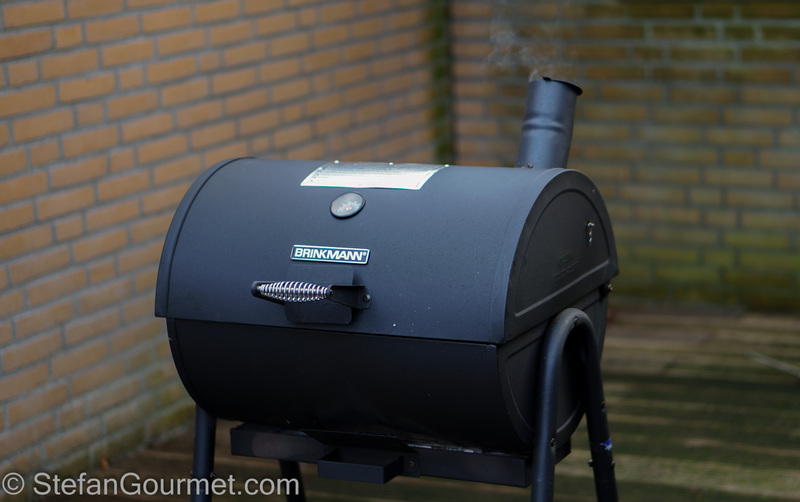 For cold smoking the temperature should not be above 30ºC/85ºF, so it is ideal to use in winter time. If you want to smoke something for more than 10 hours, you can simply fill it up with smoking dust again and continue to smoke. 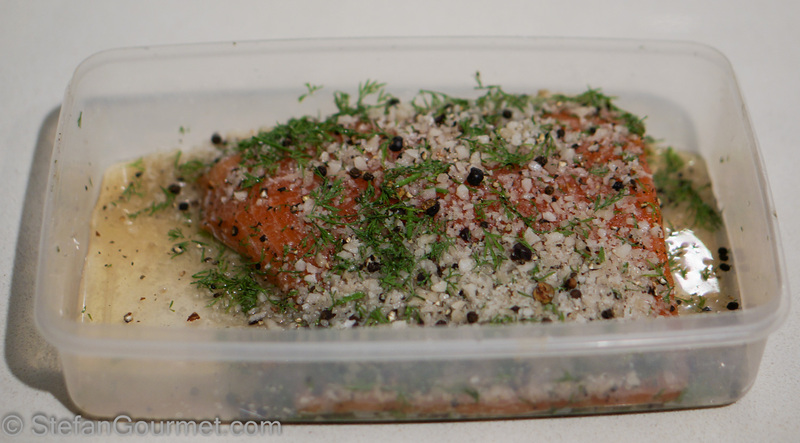 Combine the salt, sugar, dill, pepper, and juniper berries in a shallow container that is just big enough for the piece of salmon. Stir to mix. 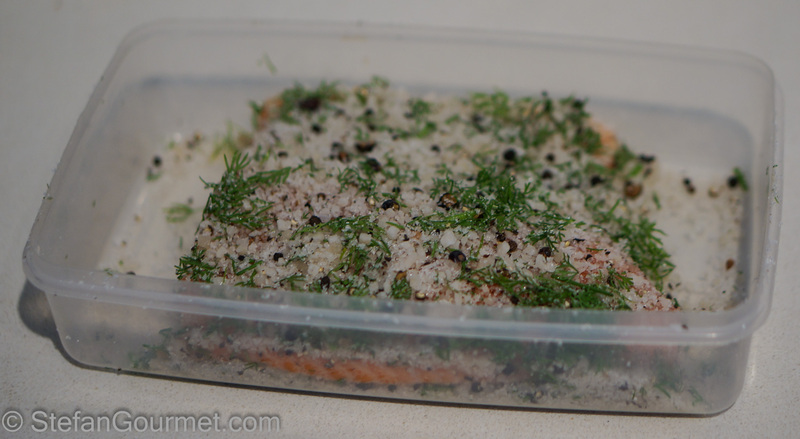 Cover the salmon with the mixture, then cover the container and refrigerate for at least 2 hours, but better is 24 or even 48 to cure the salmon. 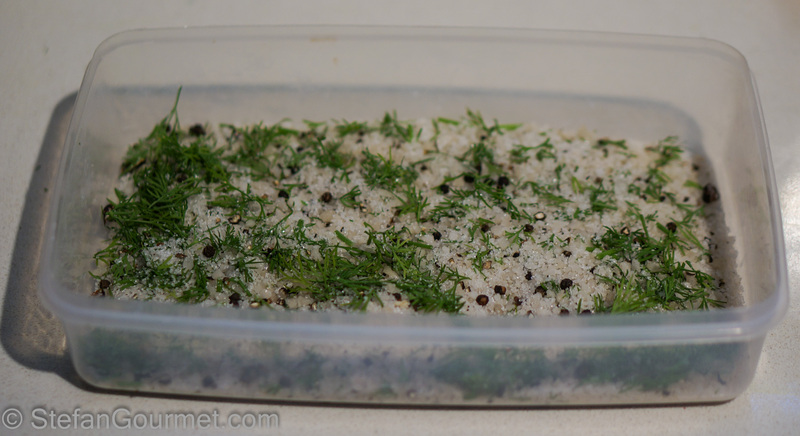 This is the same as for gravlax; the salmon will be cured: it will release some juices and firm up. 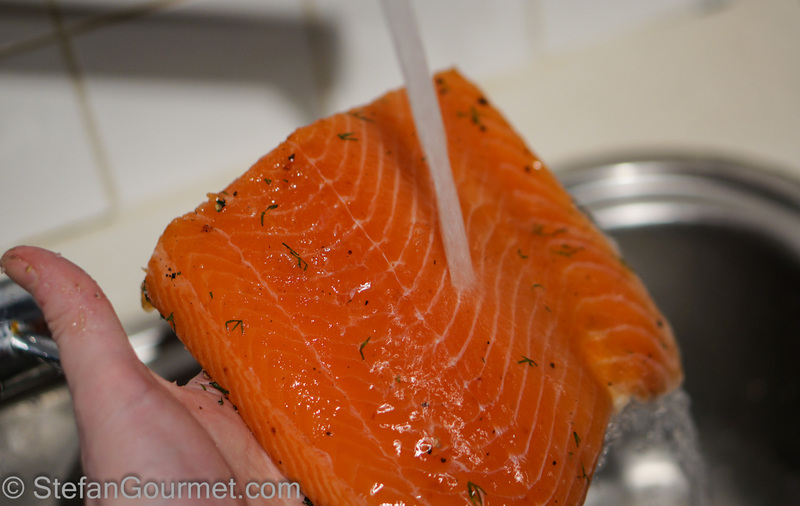 Rinse the salmon under cold running water. 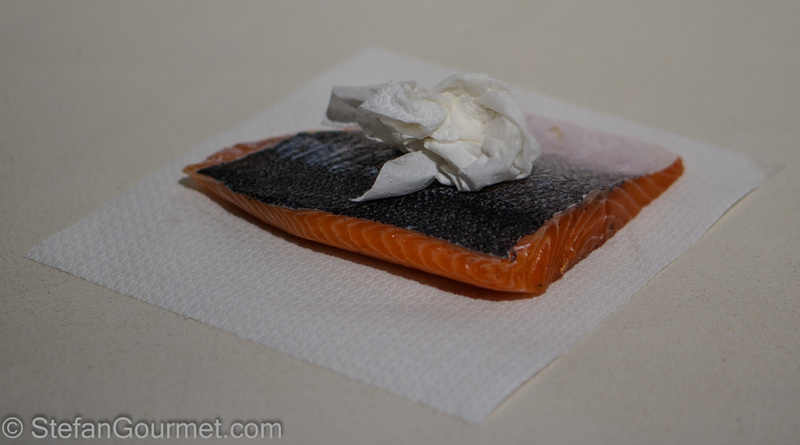 Pat the salmon dry carefully with paper towels. It is important that it is completely dry. Fill the cold smoke generator with fine smoking dust (oak) and light it with a small candle. 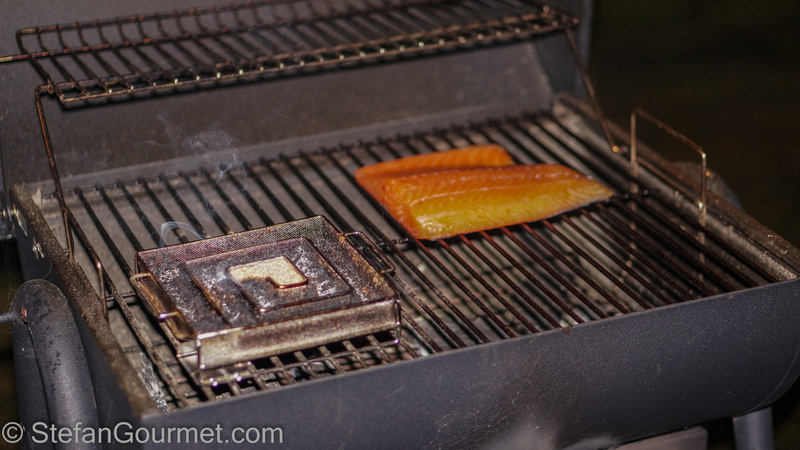 Put the smoke generator in a grill or other closed but ventilated space together with the cured salmon. Keep the grill closed to keep in all the smoke. The dust in the smoke generator will burn up slowly, following the ‘maze’. The grill will stay cool. 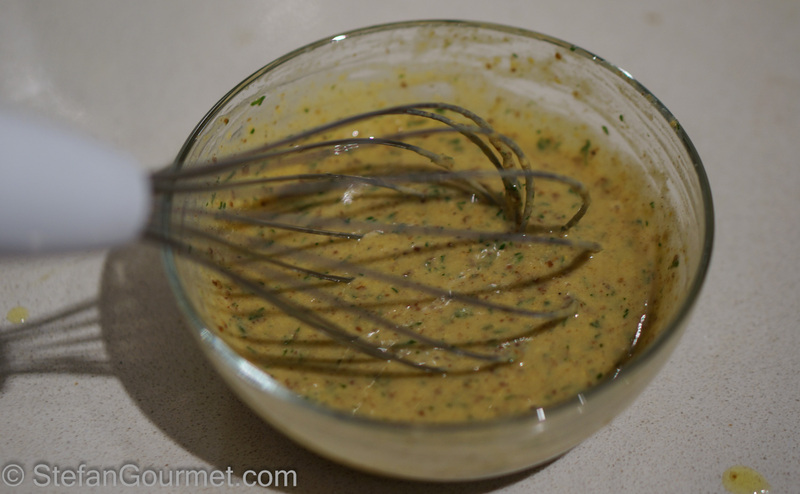 In the meantime you have plenty of time to make the sweet mustard sauce. 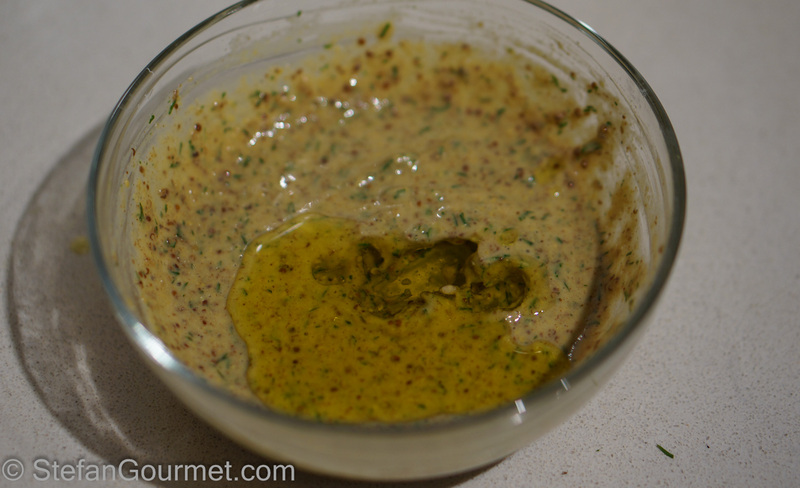 Combine the mustard, dill, sugar, salt, and pepper in a bowl. 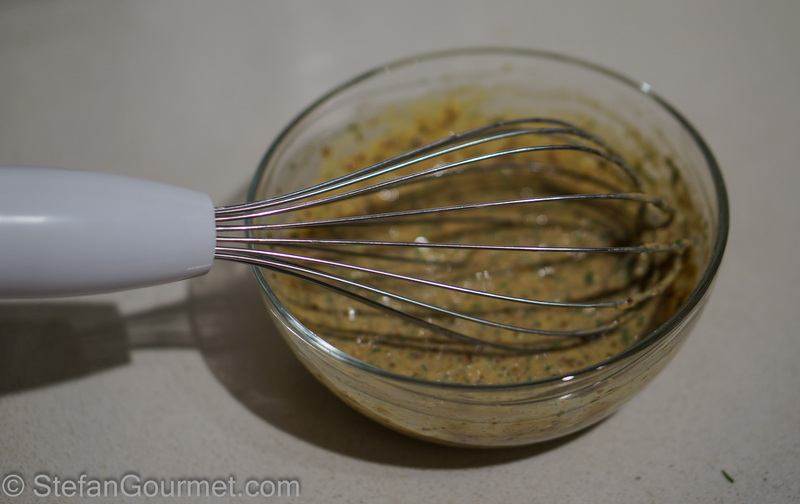 …and whisk to incorporate. 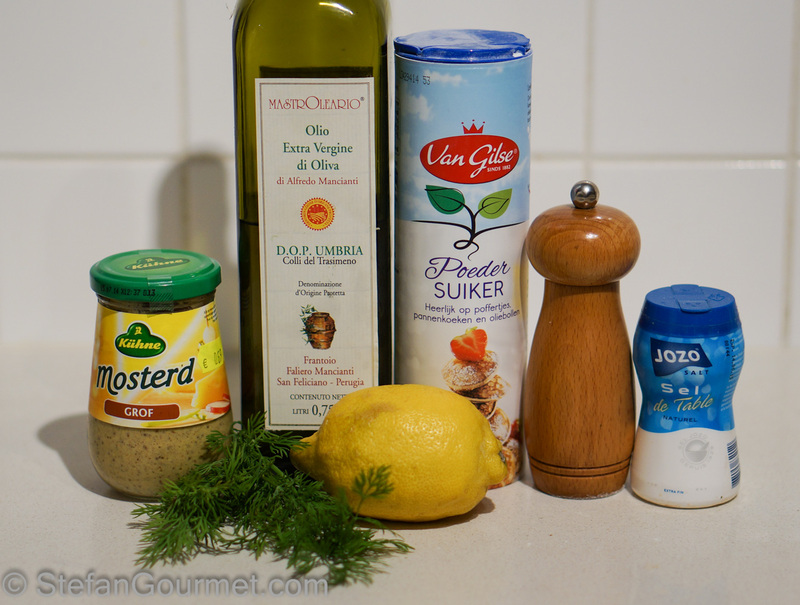 Repeat with the other two tablespoons of olive oil. 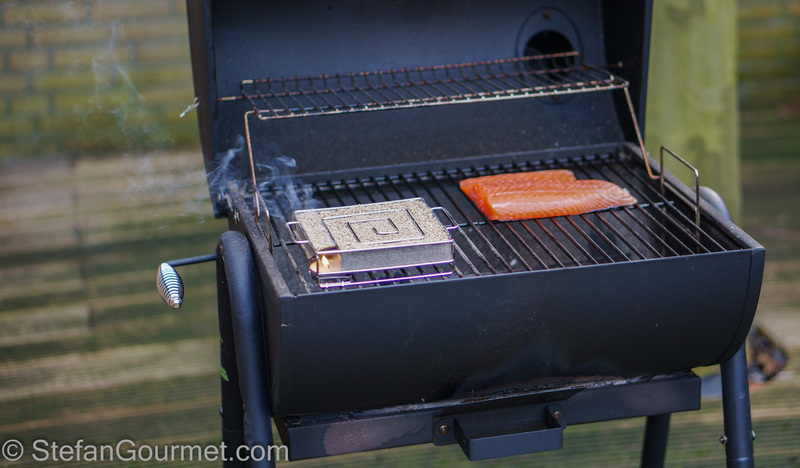 By the time I was ready to serve the salmon, the smoke generator hadn’t even completely burned up yet. The salmon had obtained a very pleasant smoky flavor. I bet it would be even better after 24 hours of cold smoking, which is what I’m going to try next. Slice the salmon thinly on an angle. 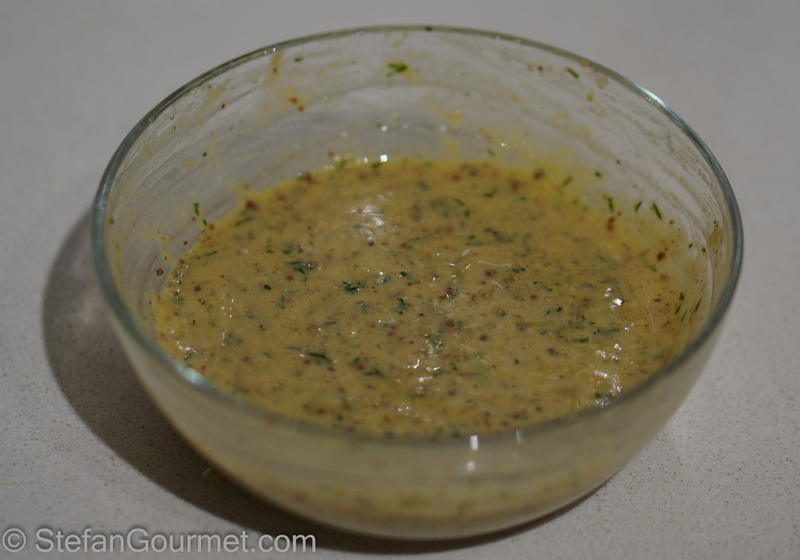 Serve it with the mustard sauce. This is great with many white wines, especially oaked ones that are not too heavy like a white Burgundy. Also champagne works very well. I find recipes with butternut squash are often lacking in taste, or don’t taste of squash. 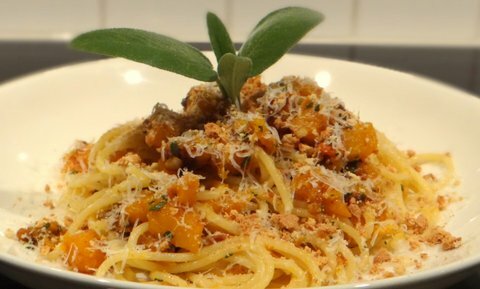 This spaghettini with butternut squash and sage is not only very tasty but also tastes of butternut squash. Non ho curiosato a fondo nel tuo passato ma… di quanta attrezzatura disponi? That looks excellent Stefan. Commercially, here in Ireland, some of the producers smoke for 10 hours. The Quinlan’s in Co. Kerry, for whom we are doing a bit of work, smoke their wild salmon for between 20 and 24 hours. It is an awesome product. Yours looks excellent. I really approve of you knife skills. 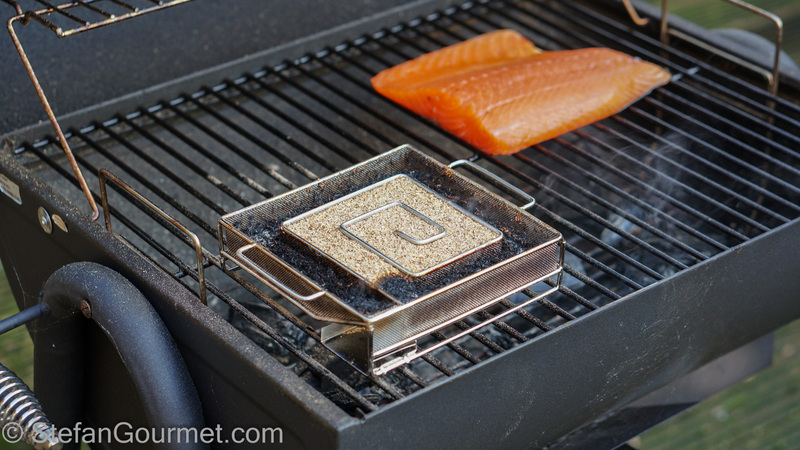 What an interesting way to smoke salmon, I had never heard of this technique! Interresting method. Where did you find the cold smoke generator? Or did you do built it yourself? I bought it online from rookoven dot com. I’m enjoying your blog immensely, you are very talented, and your photography is stunning. If you want to add a food photography tutorial it would be well received! I tried cold smoking salmon recently (I forgot to add ventilation to the cardboard box I used which ended up warm smoking the salmon instead) and the instructions called for a 12 hour Pellicle formation period in the fridge after washing the salt off. Did you do this too? Or did it work well without this step? Here’s the instructions I followed. Hi, thanks for the nice message. I don’t think of myself as a photographer, but I have learnt a lot over the last three years so perhaps I may do a tutorial after all. I skipped the pellicle formation and it still came out great. With the pellicle it will certainly *look* better though. Cheers Stefan, if you had time do you think you would do the pellicle formation stage? Or is it really unimportant? It’s on my to do list to do a side-by-side comparison of smoking with and without pellicle. 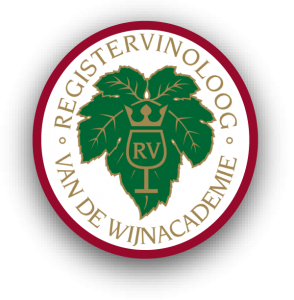 Thank You for your blog with many tips for a sous vide freshman. 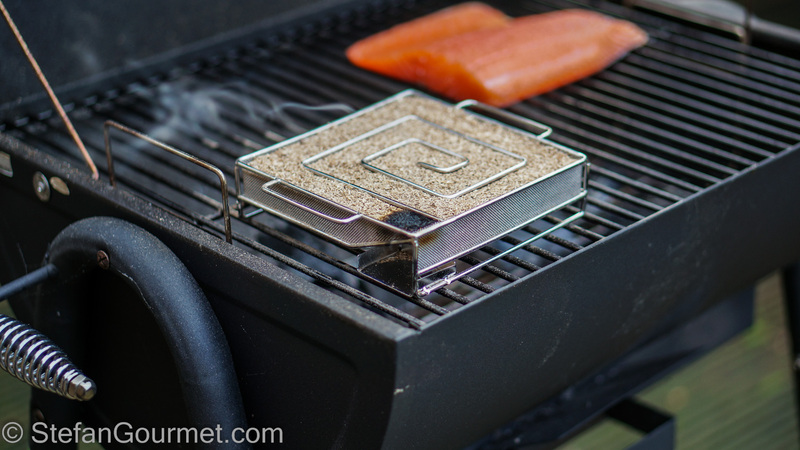 My absolutely favorite way to make salmon nowadays is to combine elements of this recipe: graving -> cold smoking with sous vide cooking inbetween (36-40 C/25 minutes). I use cold smoking time only about 1 hour and then let flavour mature in the refrigerator overnight. 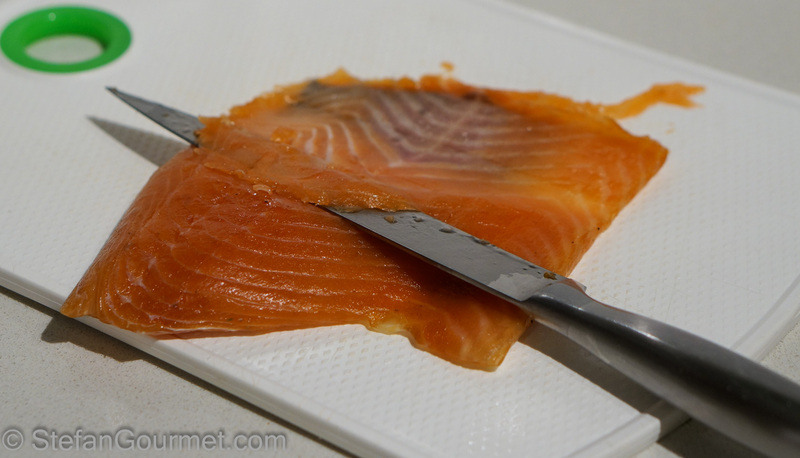 At 36 C fish remains still sliceble with a sharp knife, but is nicely softened. I also use a little bit less salt as in common graving. When smoking is quite light also for example asian flavours can be combined with this dish. Hi Mika, glad you like the blog. 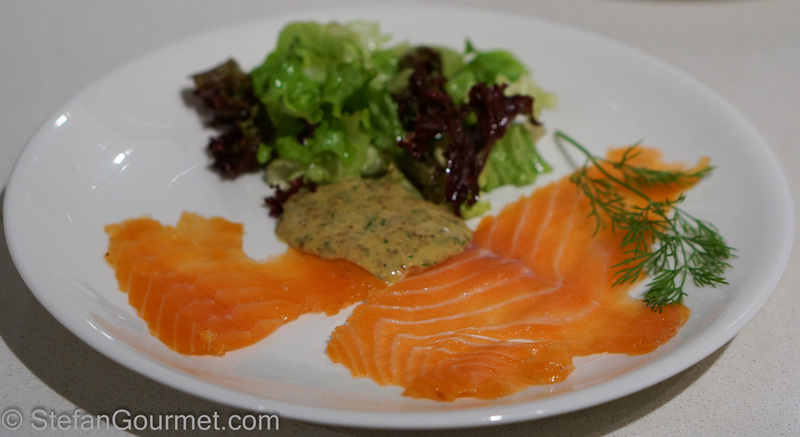 I actually prefer salmon at 43C because it becomes so wonderfully buttery. I like your idea of cold smoking it first, I’ll have to try that. 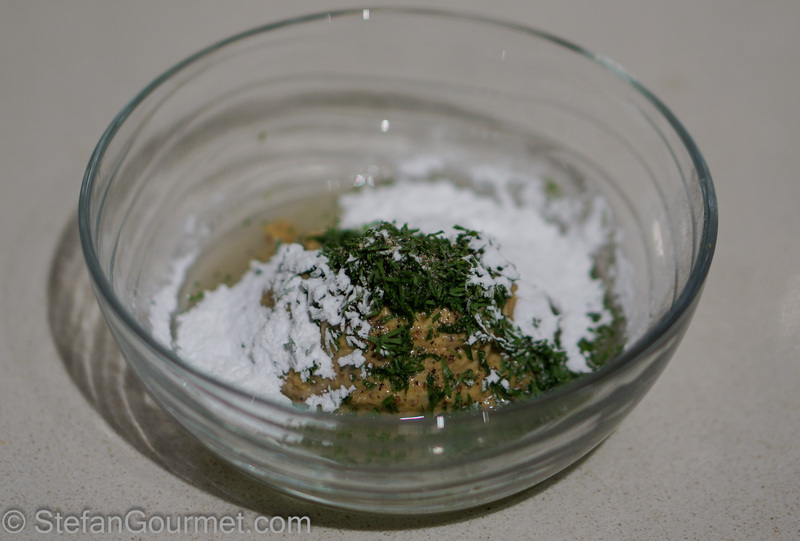 What other things do you like to prepare sous-vide?